LoveFit - the UK’s first music and fitness festival – returns in 2019 for three days of adrenaline inducing fitness and adventure activities followed by boutique after parties. Hotel Bell Tent will be welcoming festival-goers with wonderfully comfortable accommodation and exclusive facilities, for a 2 night stay – Friday & Saturday, for an extra touch of luxury to complete your weekend. To make your stay that bit more enjoyable the Hotel Bell Tent reception will be open during the event with our lovely staff on hand to provide you with five star service so you really can kick back, relax and enjoy the festival. A communal tent will be available for guests to chill out in during the event, offering a comfortable lounging space filled with squishy seating and beautiful décor. Hotel Bell Tent guests will be able to keep their phones and cameras fully charged using the facilities in the designated phone charging tent. 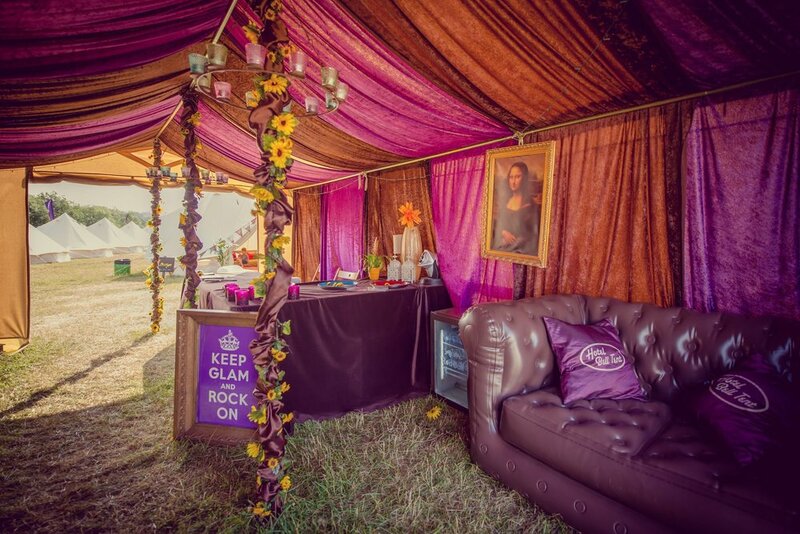 The Hotel Bell Tent pamper tent is the perfect place to refresh your festival look, complete with big Hollywood-style mirrors, chairs and hairdryers to really put the glam in glamping. Hotel Bell Tent will be sited just a short walk from the high-end toilets and lovely hot showers within the boutique camping field.